After a lackluster December update, I'm happy to report that Custom Question Lists Phase 2 (saving) has shipped! Clicking the + button launch a dialog with the same options as the Filter and Sort options giving you the ability to save the view. Please give it a try. 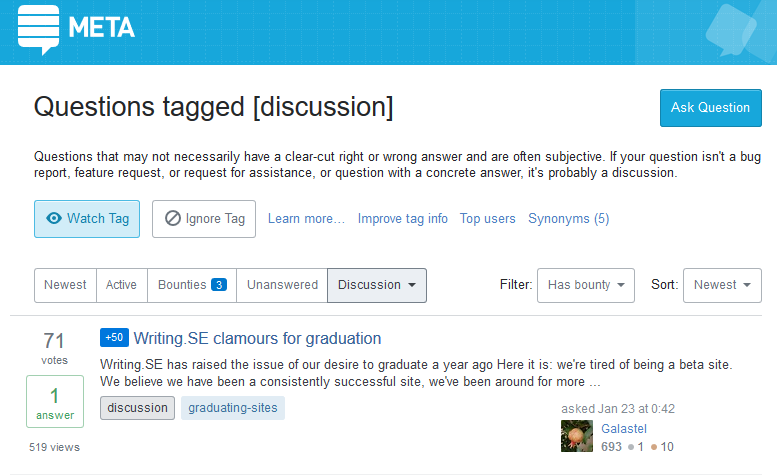 If you have any questions, bugs, or feedback, you can reply to this post directly or add a new question with the custom-question-lists tag. Phase 3 of this project is to add more utility to these saved lists, adding them to the main left navigation and adding indicators for new content. We've already made significant progress on this front, our production Tag Server is already set up to send back content notifications and I have a version of the web app running locally. It still needs to go through architecture review, get a design treatment, and get a healthy dose of performance testing and other scrutiny, but the end is near. 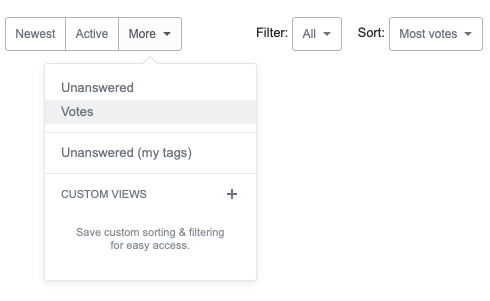 Are the "Filter" and "Sort" dropdowns on the right side supposed to be independent of the custom question list? 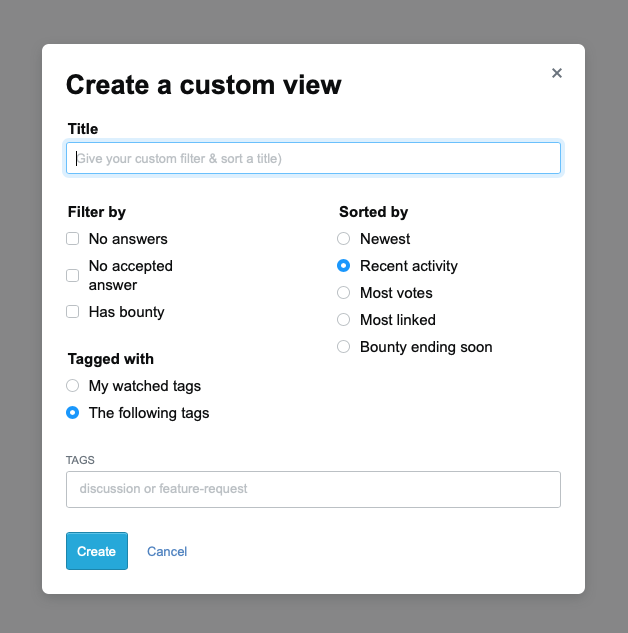 When I create a custom view and then change the filter or sort setting, it creates a new "unsaved" custom view. I assumed it would just apply the sort or filter to my existing view. There is a plural issue in the custom view title character validation. The title is allowing 32 characters, if I'm trying to enter the 33rd character it showing the validation message as "Title is 1 characters too long." It is supposed to be "Title is 1 character too long." OoOoh new stuff! Unfortunately, I've had it for five minutes and broke it a little. The other nav (RIP) let me use wildcards, so this one should too. 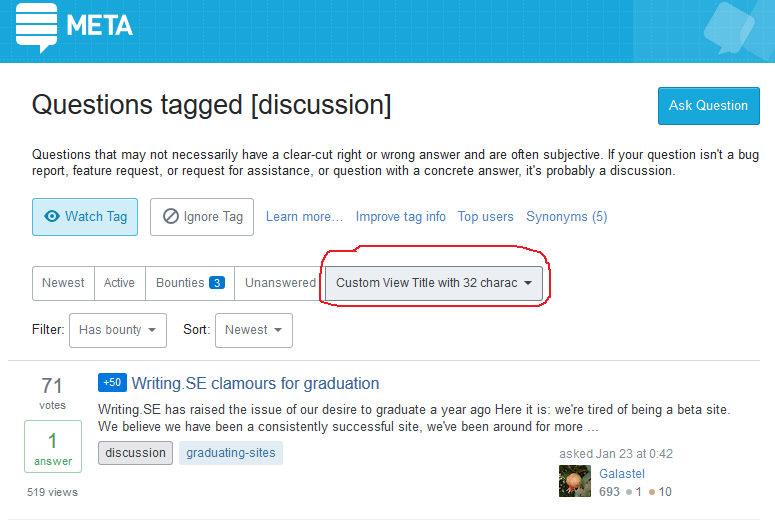 The new custom view title is allowing 32 characters length. If we are utilizing the full length in the title, the Filter and Sort are displaying the next line. The same design issue happened, when less number of characters title with Sort: Bounty ending soon option selected. But when I click on the notification, it shows questions that don't match my filters. 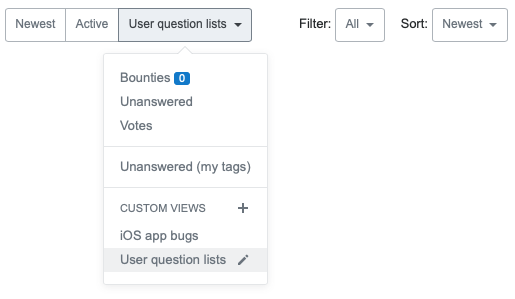 Shouldn't new questions match my filters? Or at least don't show notifications at all. While scrolling the page when the top bar is sticky, the opened custom view dialog box is overlapped with the top bar. Since the other options, Filter, Sort are hide under the top bar while scrolling, for the uniformity the custom view dialog box also may hide under the top bar. In the Filter option, if I select any tag with the The following tags option textbox and click out of the dialog box it closed the dialog box and the selected tag's related questions are loaded properly. 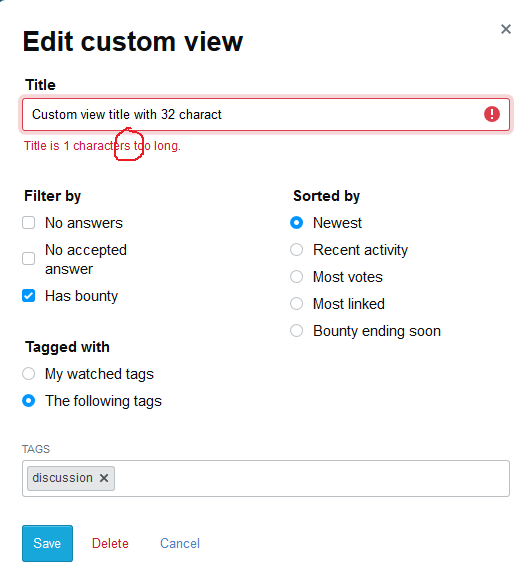 Again if I want to filter any other specific tag, I click on the Reset option which is located above the textbox and select any other tag, and clicked out of the dialog box, the newly selected tag's related questions are not loaded, instead it stayed with the previous selected tag. Seems in the second time the call is not triggered.